1. Make a hot water infusion with 10 oz. of dried herbs in 3 cups of water (see Herbal Teas). 2. Let steep at least 20 minutes. 3. Add a cup to your bath water. 1. Let the herb you want to infuse sit overnight so it will lose water. 2. Fill a jar with as much of the herb as you want to infuse leaving 3 inches from the top. 3. Cover the herb with oil and add 2 more inches of oil. Herb exposed to air will mold. 4. Pour into a double boiler. The oil should heat slowly over low heat for 3 hours. You can do this in a crock-pot on the low setting also. 5. Strain into a clean, dark, airtight jar and store in a cool, dark place. 1. Follow steps 1, 2, and 3 as above. 2. Let sit in the sun or in a greenhouse for six weeks. 3. Strain into a clean, airtight dark jar and store in a cool dark place. Don’t be surprised if the oil doesn’t smell like the plant. It most often doesn’t. 1. Boil water in a non-reactive pot (glass, stainless steel, cast iron or enamel-do NOT use copper or aluminum because harmful metals from these materials can contaminate water) and remove from burner. 2. Use 1 teaspoon of fresh herb to 1 cup of water, cover, and steep for at least 20 minutes, overnight if possible. 1. Boil water as above. 2. Use 1 tablespoon of fresh herb (1 teaspoon of dry) per cup of water, but make a quart at a time. Add herb, cover and steep as above. 3. Strain and drink small amounts throughout the day-3 to 4 cups total. To make a compress, soak a clean piece of soft cloth in a hot infusion, decoction, or tincture, diluted with water. Squeeze out the excess liquid loosely. Hold the cloth against the affected area. When it cools, repeat, making sure the mix is still hot. This often accelerates healing wounds or muscle injuries. You can use a cold compress for headaches. These provide thorough deep cleansing. The heat produces perspiration, which eliminates toxins and stimulates circulation. The steam softens the skin and opens the pores, which helps the skin absorb the beneficial properties of the herbs. Recommendations: for normal skin, once a week-for oily skin, 2 or 3 times a week-for dry skin, once every 2 weeks. Herbs to Use: The following herbs are for soothing and gentle cleansing: applemint, chamomile, chervil, lavender, lemon balm, rose petals, spearmint, and thyme. For improved circulation: rosemary and nettles. For healing: comfrey root and leaves, and fennel. For oily skin: calendula, horsetail, lupine seed, sage, and yarrow. For dry skin: borage, houseleek, lady's mantle, marsh mallow roots, parsley, burnet, sorrel, sweet violet. For mature skin: dandelion, elder flowers, lemon verbena, red clover, tansy. To Prepare: Use 2 handfuls of fresh herb or 3 TBS dry. Tie back hair; remove make-up. Pour 6 cups boiling water over herbs. Stir with a chopstick. Hold your face 12" from the solution, making a tent over your head with a towel. Close your eyes. Takes 10 to 15 minutes. Rinse with warm water, then cold, then with witch hazel. A diluted vinegar or infusion of peppermint, elderflower, sage, or yarrow dabbed on with cotton will tighten the pores. Avoid sudden changes in temperature for an hour. There's nothing like a steamy bath to work out the kinks after gardening. Try adding some herbal infusions to make it even more soothing. Add lavender for relaxation, skin soothers like thyme, spearmint, lemon balm, and lavender, and spearmint for healing. Stimulating herbs, such as basil, lavender, lemon balm, lemon verbena, mint, sage, and thyme will perk you up when you're low. For relaxation: chamomile, hops, jasmine, linden flowers, meadowsweet, and valerian. For healing: calendula, comfrey, houseleek, lady's mantle, spearmint, and yarrow. For a spring tonic: blackberry leaves, dandelion, and nettle. Mix the herbs up in combinations or use them alone. 1. 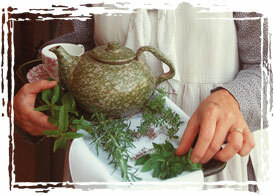 Make a hot water infusion with 10 ounces of dried herbs in 3 cups of water (see Herbal Teas). 3. Add about a cup to your bath water. Plant ingredients can be extracted by oils. You can use one herb or combine herbs in the same oil. By using different herbal combinations, you can make strong medicinal oils (for external use only) or sweet-scented massage and bath oils. Once you have made the oils, they can be made into salves or ointments. There are lots of carrier or base oils to choose from. My favorite for medicinal purposes is olive oil. For bath, massage, or cosmetic oils, I prefer to use apricot kernel oil, almond oil, or grapeseed oil because these are light and easily absorbed by the skin.Grapeseed is the lightest of the three. Also, none of these have a strong scent to overpower the herbs. There are lots of carrier or base oils to choose from. My favorite for medicinal purposes is olive oil. For bath, massage, or cosmetic oils, I prefer to use apricot kernel oil, almond oil, or grapeseed oil because these are light and easily absorbed by the skin. Grapeseed is the lightest of the three. Also, none of these have a strong scent to overpower the herbs. For cooking oils, I use corn, canola, or olive oil. My favorite for taste and health is cold-pressed, extra-virgin olive oil. You can use fresh or dried herbs. Fresh herbs should be placed in a shaded, warm place for several hours or overnight, after picking. This allows most of the moisture to evaporate. If you don't do this, the oil will look milky, allow mold to grow, and could even sour. St. John's wort flowers, rosemary, comfrey, calendula, and chickweed are good herbs to make medicinal oils and salves from. 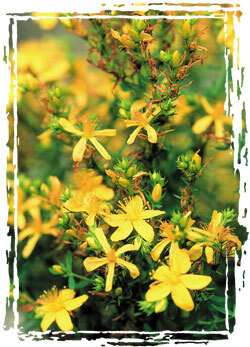 Use the flowers from St. John's wort with the cold infusion method. These flowers should not sit overnight; put them in oil as soon as you pick them, and when you strain the oil, do so through cheesecloth. Make rosemary oil and salve from oils infused by the hot method. First, strip the leaves from the stems, and let them sit overnight to dry a little. Standard portions for infused oils are 2 to 3 ounces of dry herb to 2 cups oil, but if you wish to use my simple method: fill a glass pot with the chosen herb or herb blend, and cover it with oil plus 1 more inch. Then choose which method you are going to use: hot or cold. 1. Let the herb you want to infuse sit overnight, so it will lose water. 2. Fill a jar with as much herb as you want to infuse to 3" from the top. 3. Fill the jar with oil enough to cover the herb, plus 2". Because herb exposed to air will mold, make sure all the herb is covered. 4. Let sit in the sun or in a greenhouse for six to eight weeks. 5. Strain into a clean, airtight, dark jar. Label, date, and store in a cool, dark place. Don't be surprised if the oil doesn't smell like the plant. It most often doesn't. For a stronger oil, repeat the process. Double oleate oils are twice as strong, and triple oleate, three times as strong, etc. 2. Fill a pot with as much herb as you want to infuse. Use a non-reactive pot. Glass is my first choice. You also can use stainless steel, enamel, or cast iron. Do not use aluminum or copper. 3. Cover the herb with oil and add two more inches of oil. 4. A double boiler is convenient, but if you don't have one, put the pot in a bigger pot that has water in it. The oil should heat slowly over low heat for three hours. Do not overheat because too intense heat will destroy the volatile oils you are trying to collect. You can do this in a crockpot on the lowest setting also. 5. Strain into a clean, airtight jar, and store in a cool, dark place. I'm a salad person. Maybe it's because my mother served salad religiously after every dinner like the French do. I tend to think it's because of the yummy salad dressings she made, not the greens. She's the one who taught me how to take ordinary oil and vinegar and make it into something out of this world. It's the vinegar that flavors the dressing and there’s nothing to infusing vinegar. After you try it, you’ll never use unflavored again. The key to making the best is using the best. Oils and vinegars and the freshest herbs, I mean. For flavored vinegars, use white wine vinegar, malt vinegar, or organic apple cider vinegar. The rule of thumb is 1 cup of herb to 2 cups of vinegar. Tarragon is my favorite for vinegar. As with cold oil infusions, dry out the herbs first in a shady warm place overnight, and be sure to cover the herbs completely with the vinegar as in steps 1,2, and 3. Let it set for 6 weeks in the dark and store in the dark. I keep mine near the stove in a brown paper bag during the steeping so I remember to shake it. Oils should be done the same way. I use olive oil as a base for all cooking oils. I often combine herbs like thyme and rosemary in oils for cooking. Basil oil is the best on fresh bread with roasted garlic. I stay away from making garlic oil because it goes rancid fast-so I just roast it and eat it alongside. The recipe is the same as for the vinegars. Use the cold oil infusion method, but cure them on a sunny windowsill, and store in the dark. There's nothing I like better than to while away an afternoon with a good book and an herbal tea, but I rarely get the time. Herbs for beverage teas can be used alone or added to black tea for flavoring. They're good as cool summer drinks, too. Any scented geranium, lavender, mint, lemongrass, lemon balm, lemon verbena, and pineapple sage make good beverage teas. And for a real treat, try combinations of flavors like pineapple sage and rosemary, lavender and nutmeg geranium, lemon verbena and peppermint (my favorite), and orange mint and pineapple sage. 1. Boil water in a non-reactive pot (glass, stainless steel, cast iron, or enamel-do NOT use copper or aluminum because harmful metals from these materials can contaminate water) and remove from burner. Medicinal teas are not cures for anything, but they do make you feel better. They're not as strong as tinctures, but can be very effective for chronic problems when used with consistency over an extended period of time. Prepare the herbal oils needed for the type of salve you're making (See Herbal Oils). To 1 cup herbal oil, add ¼ cup beeswax. (For St. John's wort salve, use only 4 ounces of the oil to ½ ounce beeswax). I use unrefined beeswax I get from a local beekeeper. It has a lovely honey taste and smell. Put the oil in a glass container, and place in hot water on a low heat setting so water is very hot, but not boiling. Stir occasionally until all the wax is melted. You can add vitamin E, vitamin A, coconut oil, lanolin, cocoa butter, and essential oils, if you wish. Do not add anything that is not oil based because it will not mix into the herbal oils. Test the consistency by cooling the salve in a teaspoon in the fridge for about a minute. If it is too hard, re-melt and add more oil. If it is too soft, add more beeswax. When it is just right, pour into containers. These make great gifts! 1. 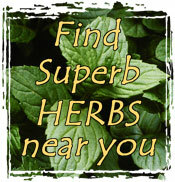 Choose the best herbs and the best quality menstruum. When I use fresh herbs, I use liquor (usually 80 proof vodka) with a high alcohol content because fresh herbs contain about 3 times as much water as dry herbs. I lay the herbs in a shady warm place right after I pick them to let moisture evaporate. 2. Chop the herbs in a blender with a little of the menstruum. You can do this by hand, also. Put them in a wide-mouthed jar and cover them completely with the menstruum. You have to make sure the herbs are completely covered or they'll mold. 3. Put in a dark warm place for 2 to 8 weeks and shake everyday. I put my jars under a paper bag on the kitchen counter to remind myself to shake them everyday. The longer you leave it to steep, the better (eight weeks is better than two). 4. Strain and squeeze out all the liquid you can. Bottle, label, and store in a dark, cool place. Tinctures are taken by placing drops under the tongue. 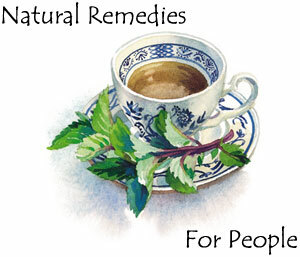 For chronic illnesses, it is suggested to use ¼ teaspoon of tincture three times per day. For an acute situation, 1/8 to ¼ teaspoon every ½ hour works best. Another rule of thumb is to use 1 drop of tincture for every 5 pounds of body weight. Brunettes can add shine to their hair with a basil/rosemary rinse. Blonds can do the same with a chamomile/basil rinse. To make a rinse, make a strong infusion of the herbs using 2 TBS of herb per cup of water. Pour it over your hair after shampooing, catching the liquid in a pan, and rinse as many times as you wish. For stomachache, nausea, and menstrual crampswarm milk drink with fresh or dry leaves. Make an infused oil to use as a hair conditioner, to rub on temples to relieve stress, or even to use in cooking. Pick fresh sprigs and let them sit overnight. Remove needles, place in a jar, and cover entirely with oil. Do not let any herb expose to air or it will mold. Cover and set in a warm place like a sunny windowsill. Shake every day from 14 days to 6 weeks. Strain, label, and date, and store in a cool, dark place. Tinctures are made from the aerial parts of the plant (aerial parts are plant parts above ground-stems, leaves, and flowers). Harvest as the plant begins to flower for best potency. Allow moisture to evaporate overnight. Chop and fill a jar, short of 2" from the top, with the plant material. Fill the jar, covering all the plant material, with 80 proof vodka. Keep in a dark place for 8 weeks, shaking it every day. Strain it and bottle. Label and date, and store in a cool, dark place. Shelf life is said to be a year, but in truth, it is much longer, up to 3 to 5 years. A good tincture for mild depression combines 2 parts St. John's wort herb with 1 part each of the following: lavender, oatstraw (can be purchased in almost any health food store), and mugwort (Artemisia vulgaris). Infused oils are made with the flowers. Put in a jar and cover completely with olive oil. Place on a warm, sunny windowsill or in a greenhouse. Let steep for 8 weeks. Strain, pressing out as much oil as possible. Bottle and label. Store in a cool dark place. A good massage oil for muscle pain (or any injury involving soft tissue) combines the following infused oils in equal parts: St John's wort, arnica, and cayenne, with ¼ part wintergreen essential oil. 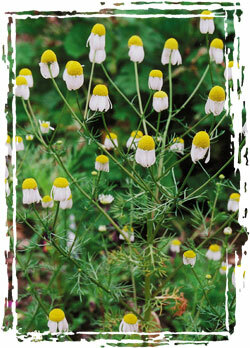 Relaxing tea blend: Mix 2 tsp dried chamomile flowers, 1 ½ tsp lavender, 1 tsp elder flowers, and 1/8 tsp ground cloves. Boil 2 ½ cups water. Remove from the heat. Add the herbs and cover the container. Let steep for 20 minutes. Add honey to taste. Heat together in a double boiler for 30 minutes. Don't let the milk boil or form a skin. Infuse for 2 hours. Strain. Apply with cotton balls and remove excess with tissue. Keeps refrigerated for a week.